Donald “D.A.” Henderson, a physician, educator, and epidemiologist who led the World Health Organization’s campaign to eradicate smallpox, died at 87 years of age on Aug. 19, 2016. Vincent was fortunate to have the opportunity to speak with DA Henderson in 2014 about his career, the smallpox eradication effort, and what it means for the eradication of polio. 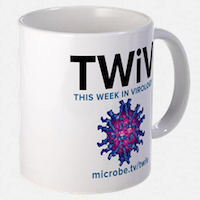 The TWiVologists discuss the finding of a second transmissible cancer in Tasmanian devils, and development of new poliovirus strains for the production of inactivated vaccine in the post-eradication era. Vincent and Alan meet up with Julie and Paul at the General Meeting of the American Society for Microbiology in Boston, to talk about their work on the pathogenesis of poliovirus and measles virus. Vincent, Rich, Mark, and Trine discuss science and medicine in journalism and the eradication of poliovirus at the 51st Interscience Conference on Antimicrobial Agents and Chemotherapy (ICAAC). Vincent and Alan converse about making published science accessible to everyone, global eradication of poliomyelitis, and whether a plant virus can cause disease in humans.